Daniel J. van Ingen, Psy.D. 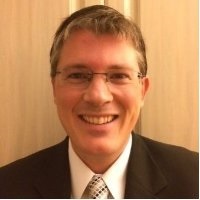 Daniel van Ingen, Psy.D., is a Licensed Clinical Psychologist, and the author of 3 books: Anxiety Disorders Made Simple: Treatment Approaches to Overcome Fear and Build Resiliency, You Are Your Child’s Best Psychologist: 7 Keys to Parenting with Excellence, and Flourish: Breaking Free with Less TV. He earned his B.A. in psychology at the University of St. Thomas in St. Paul, Minnesota, where he was a medal of courage recipient and had a tree planted in his name for his support and advocacy for minority students. He earned his M.A. at Saint Mary’s University in Minneapolis and his Psy.D. at the University of St. Thomas Graduate School of Professional Psychology. Some of his experiences include coordinating a PTSD clinic at a VA medical center, work in two college counseling centers, service in substance abuse outpatient treatment, training medical residents in St. Petersburg, FL, and directing a day treatment program for adults with intellectual disabilities and challenging behavior for five years. Dr. van Ingen, trained as a scholar-practitioner, has many empirical studies published on cognitive behavioral therapy for anxiety disorders, parenting research, and disabilities. He has presented at national and international conferences for over 15 years. His book, Anxiety Disorders Made Simple: Treatment Approaches to Overcoming Fear and Building Resiliency, has received outstanding reviews from psychologists, psychiatrists, and social workers alike. He has been dubbed the Sarasota Parenting Doctor in his private practice work with families. He is co-founder of Parenting Doctors [www.parentingdoctors. com], an organization dedicated to serving Sarasota County families. He is a national speaker, blogs anxiety articles and posts weekly parenting podcasts on his website www.danvaningen.com, also available at ITunes. He has been featured on ABC-7 for his expertise on anxiety treatment. Follow him at twitter @drvaningen, his Facebook page: Anxiety Disorders Made Simple, and at his Parenting Doctors YouTube channel. Financial: Daniel van Ingen maintains a private practice. He receives a speaking honorarium from PESI, Inc. Non-financial: Daniel van Ingen has no relevant non-financial relationship to disclose. 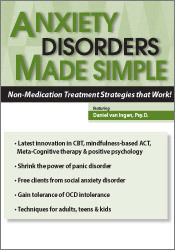 Anxiety Disorders Made Simple: Non-Medication Treatment Strategies That Work!